For North Americans, there’s no better place to ride out the winter than here in Australia. South East Queensland, with The Gold Coast, The Sunshine Coast, and the regional capital city of Brisbane, is one of the most beautiful areas in Australia. With average daytime maximums around 82ºF and minimums of 68-77ºF, this area attracts visitors from cooler regions in Australia as well as overseas visitors escaping the cold. Most of these visitors look for privately owned rental properties for their stays. Beaches are uncrowded, and public parks often offer gym equipment and BBQs. Both public and private swimming pools are everywhere. The atmosphere is casual and laid-back, very friendly. Also, thanks to a dramatic shift in currency exchange rates, U.S. dollar-holders now have 32% more buying power in Australia than they had just last year. The countryside and beaches are amazing, and interesting and unique wildlife abound. But there’s one added bonus that many readers will appreciate: world class golf. Australia is one of the least densely populated countries in the world with about eight people per square mile. This compares to 85 per square mile in the U.S., and many Americans appreciate the uncrowded feeling. 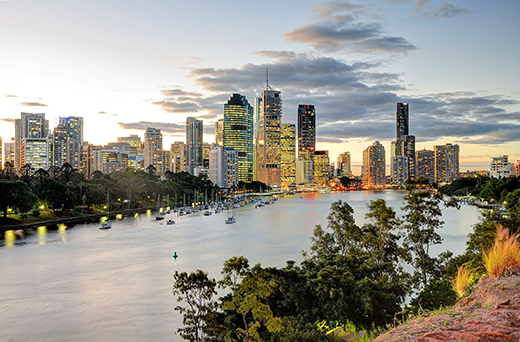 The largest city in the northeastern state of Queensland is Brisbane, home to nearly half the state’s inhabitants. Its population is young, vibrant, and growing. And Queensland’s northern city of Cairns is the main starting point for visitors to the Great Barrier Reef. In terms of both crime rates and for having an honest culture, Australia ranks ahead of the United States. In fact, Transparency International’s Corruption Index rates Australia at position 11 in the world (between Canada and Germany), ahead of the U.S. at position 17. Australia is an English-speaking, sports-mad country and with a total coastline of 8,300 miles. Queensland occupies 22% of the Australian continent, and the size means a significant variation in climate across the nation, from low rainfall and hot summers inland and to the west and monsoonal wet season in the north to warm temperate conditions on the coasts that are ideal for playing golf. Unlike New Zealand, where retirement thresholds are high, Australia has a retirement visa program that is relatively friendly. The four-year, Standard Retirement Visa requires that you be over 55, bring no dependents other than a spouse/partner, have a clean criminal record, obtain health insurance, and be able to support yourself. Holiday letting is a favorite way for families to take vacations throughout Australia and South East Queensland. For an American owning property in this area it means you can use it yourself for several months a year and then earn income from holiday letting when you are back in the U.S. Expect to get about US$400 per week, on average, for properties like these. Here are five of the best golf courses in areas where house prices are favorable, especially at the current exchange rate. 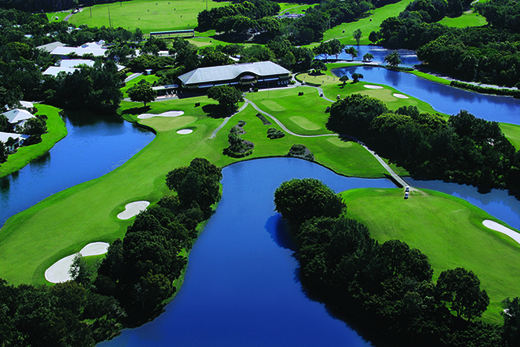 Located just 30 minutes from Brisbane’s central business district, Brookwater is Queensland’s premier golf course. Designed by Greg Norman, the award-winning public access course offers a golfing experience you won’t easily forget due to its stunning natural environment. The average purchase price for houses in Springfield Lakes in the last year was US$290,000, based on 311 sales. Compared to five years ago prices have increased 17.9%, so there is the potential for capital growth here as well as rental yield. In Springfield Lakes, a brand-new four-bedroom home with a two-car garage is currently on the market for US$294,000. Boonah Golf Course has been professionally designed and is widely acclaimed as one of the best country courses with arguably the best greens you will play on in S.E. Queensland. You are sure to enjoy a golfing experience on this course, one that will be accompanied by the local resident kangaroos, pelicans, and much more. In this area, home and land packages for brand-new modern-design homes will cost around US$263,000. This includes four bedrooms with en-suite baths, double garage, undercover alfresco area, large open-plan living room, and kitchen with breakfast bar. Although this excellent quality course designed by Robert Trent Jones Jr. is just 500 meters away from the sea in some places, the views are more of parkland and the beautiful Mount Coolum, rather than the sea. Again, wildlife is a feature of this course, along with tough challenges where ponds and lakes hug the fairways. In this area, home and land packages for new modern-design homes with four bedrooms with en-suite baths and double garages are available for around US$336,000. Described as “the thinking man’s course,” The Palms is considered a championship course rivalling some of the best golf courses in Australia. It has a total length of 5,904 meters (off the championship tees) and numerous water features and hazards. One of two courses in the area, The Palms is a return to the traditions of the game, with distinctive holes, deep greenside bunkers, and boldly contoured greens requiring creative shot-making. Housing in Sanctuary Cove itself is expensive (usually more than AU$1million), but in nearby Pimpama you’ll find homes with four bedrooms, en-suite baths, and double garages going for about US$335,000. This is a hidden treasure. Located just 45 minutes from Brisbane airport on an island of beautiful beaches and surrounded by national parks, this course is one of two in an area completely off the tourist radar. Both courses are built on one of the world’s biggest sand islands, so you can guess what it is that’s set to bring you undone. House and land packages for homes with four bedrooms, en-suite baths, and double garages in the golf course estate start from US$320,000… and also include a marina berth for your boat. Buying new is the easiest way for overseas buyers to purchase property in Australia. 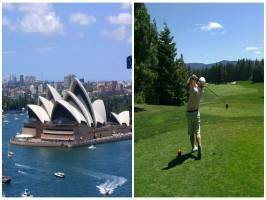 If you’d like help finding your own piece of a world golfing paradise, write to me directly at australia@thepropertyfinders.com. I can help to match your golf experience with a good deal on a new home. Editor’s note: Chris Collett has a background in human resources and general management, in both the private and public sectors in New Zealand, as well as Queensland and Victoria in Australia. Her passion for real estate developed when she became a relocation consultant, finding houses and the right schools for the staff of large companies relocating internationally. She has also worked for the Land Titles office in New Zealand. I read your article about Masachapa/Pochomil. It is an area we are going to see in late October. It is difficult to find listings there and yet you mention some. Do you have a source we could contact to see some homes? I would be terribly grateful. We do not want a planned community and have found plenty of listings at Casares/La Boquita. But we prefer the Masachapa/Pochomil area. Thank you most kindly, and I truly enjoy your newsletters. To find property listings in a non-gringo area like Masachapa, it’s best to use a search engine like Google, inputting search terms in Spanish. So I’d use “propiedades en venta Masachapa” or something similar. So, right now and until I find a new resource on the ground, I’d suggest Googling and contacting agents who come up in the search results. If you speak Spanish, great… if not, ask if they have an English-speaking agent you can work with to see some properties. No question here… I just wanted to say “good view” on that Puerto Peñasco, Mexico article. Thank you for the information you have passed on. I was under the impression that foreigners could not own land within a certain distance of the seacoast in Mexico. Perhaps that has changed? And how do you enter Mexico without stopping at the border? Or how do you re-enter the United States? I’d appreciate some specifics. No, the law has not been changed, though a change has been proposed many times. Per Mexico’s constitution, the restricted zone in Mexico is 50km from the coast and 100km from international borders. All property purchased by foreigners in these zones must be held by means of a real estate trust, called a fideicomiso. This is an entity created by the Mexican government to help promote continued foreign investment along the country’s coasts. The process for forming this trust is so routine that some real estate agents fail to even bring it up. It’s simply part of the transaction process for the tens of thousands of Americans and Canadians who have purchased property along the Mexican coastlines. The approximate cost is around US$2,400 to set up a new trust and maybe US$1,500 to take over an existing one from another foreign owner. As to crossing the border, Barry is right. You can pass into Mexico without stopping, but you won’t be able to pass into the United States that way. You’ll need valid proof of citizenship, such as a passport or passport card, to get back in. I use my Global Entry card.